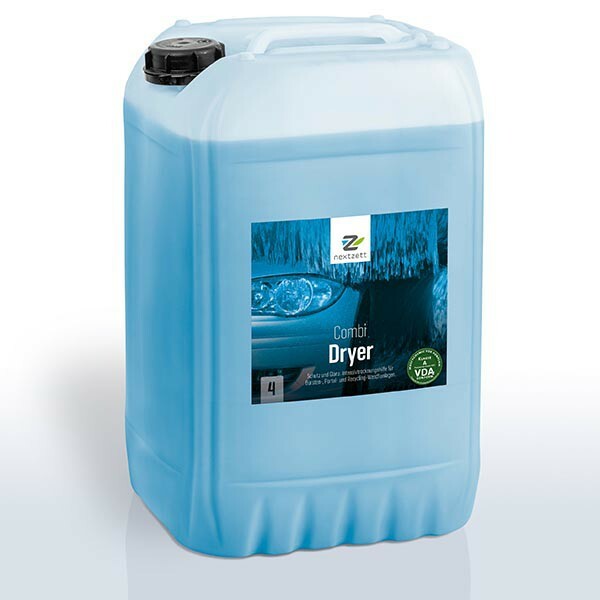 Intensive drying aid for brush portals and recycling washing systems. The fast intensive dryer is based on modern, cationic surfactants and is universally applicable in all wash lines and portal systems. An absolutely reliable drying aid with a measurably high degree of gloss. The high-quality care components give the lacquer a long-lasting, clearly visible luster.An all-round protection for the vehicles. Very suitable for biological water treatment plants. nextzett Combi Dryer , fast intensive dryer, based on modern, cationic surfactants and is used in all washes and portal systems. An absolutely reliable drying aid with a measurably high degree of gloss. The high-quality care components give the lacquer a long-lasting, clearly visible luster.An all-round protection for the vehicles. nextzett Combi Dryer guaranteed with optimum adjustment of the metering a spontaneous and large-scale elevation; Also in problem areas (short tear zone, high belt speed). nextzett Combi Dryer is injected undiluted normally with a metering pump at the optimum dilution in the dryer duct. The application is carried out without pressure by means of a dryer bow or the existing dryer nozzles of the washing system on the already washed vehicle. In exceptional cases, with oversized dosing pumps, the product can be prediluted. The spontaneous, large-area elevation of the water film ensures a virtually microbe-free drying. Best effect with a final dilution of 0.15-0.25%. Overdosing does not improve drying. Elevation of the water film after 1-3 seconds shows optimal dosage. Approx. 10-20 ml per vehicle.